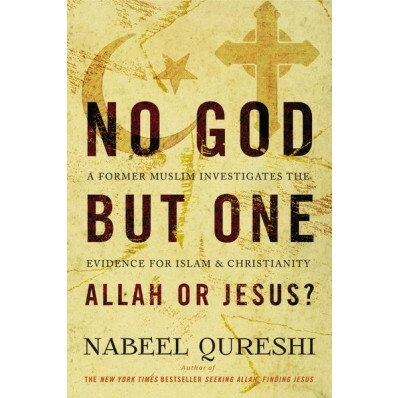 Nabeel Qureshi1 is the award-winning author of Seeking Allah, Finding Jesus (Our review is here.) and Answering Islam: A Better Way Forward. He is a speaker with Ravi Zacharias International Ministries and his credentials are impressive. He holds degrees in medicine (Eastern Virginia Medical School), Christian apologetics (Biola University), and religion (Duke University). Qureshi is currently pursuing a doctorate in New Testament studies at Oxford University. Qureshi begins this work by thanking the reader for taking the time to read his current offering. He then explains how No God, But One: Allah or Jesus? differs from Seeking Allah, Finding Jesus. The author wisely continues by explaining the importance of defining one's terms when discussing Islam and Christianity. He is careful to explain what he means by Muslim and Christian and this nicely lays the groundwork for the forthcoming discussion. The book is organized into 10 parts. Pt 6: Did Jesus Die on the Cross? Pt 7: Did Jesus Rise from the Dead? Pt 8: Did Jesus Claim to Be God? Pt 9: Is Muhammad a Prophet of God? Pt 10: Is the Quran the Word of God? Quershi strives throughout the text to present the best arguments Islam has to offer against Christianity and this is to be commended. Other authors should take note. "After reading Mark through the lens of Jewish scripture I could no longer avoid the obvious. From introduction to climax, Mark's Gospel is an exposition of the deity of Jesus." [p. 258] This portion of the book was flawlessly argued and this reader will be referring to it time and time again. Finally, it must be noted that Nabeel's case for Christianity is explained with his own story of conversion serving as the backdrop. This makes, what some would consider to be a dense book on comparative religion, highly readable. "...in the Christian worldview, sin against God is more than just doing something wrong. It is rebellion against the Sustainer of the universe. It is the most destructive force in the cosmos, the ultimate root of every pained heart, every broken family, every pointless war, every heinous genocide. Sin spreads through generations like a malignant cancer, and it razes civilizations like a plague. The effect of sin is cataclysmic. Like taking a sledgehammer to a mirror, sin shatters the image in which man is made. When Adam sinned, the image of God in man was irreparably broken. The author then shifts from the nature of man to the nature of God and this leads into a discussion about the Muslim belief in Tawhid vs. the Christianity belief in the Trinity. For those who saw Nabeel's debate with Muslim apologist Shabir Ally,2 some of these arguments will be familiar; however, this reviewer was particularly impressed with two of the arguments made by the author in this section. He further demonstrates that the Trinity is hinted at in Genesis 1:1 and makes sense of numerous Old and New Testament passages. Second, Qureshi masterfully argues that far from being self-contradictory, the complexity of the Trinity is what makes Yahweh logically consistent and self-sufficient! Consider the basic Islamic teaching of Tawhid: God is absolutely one. As the author explains, "This means that, in eternity past, before He had created anything, Allah was alone. One person, all by Himself. It was not until He chose to create the universe that Allah had anything to relate with. This is a significant theological problem because...Islam teaches that Allah is a relational being. But if He had nothing to relate with before creating the universe, how could He be a relational being?" [p. 69] Therein lies the problem. In order for Allah to actually be gracious and merciful, as Islam teaches, He has to first create the universe and this makes Allah dependent upon His creation in order to be Allah! "...the doctrine of the Trinity teaches that the three persons of God have eternally loved one another with a selfless love. God has always been relational, always been loving. His mercy and justice are not contingent upon His creation, because they are the expression of His eternal love toward humans. That love was never contingent upon mankind's existence. 2. Jesus' resurrection from the dead. The author admits that pursuing the truth about your worldview and assessing it honestly is difficult. Further, he admits that "we can never completely overcome our biases, the most important step we can take is to pursue fair-mindedness with intentionality. While considering the data, we need to repeatedly ask ourselves the question: 'Would an objective observer find the arguments compelling?'"[p. 178-179] For the remainder of the book, this question is repeatedly raised. Furthermore, as I have already mentioned, Qureshi's defense of the deity of Christ is executed flawlessly in this work and is worth the price of the book. The author concludes his investigation by examining Muhammad's life and character and the reliability of the Qur'an. He finds that the arguments he once found so persuasive crumbling under the weight of the evidence. He then examines some of the most common arguments put forth by Muslims to argue for the excellence and divine origin of the Qur'an. They include the literary excellence of the Qur'an, the fulfilled prophecies of the Qur'an, the supposed miraculous scientific knowledge in the Qur'an, the mathematical marvels in the Qur'an and the perfect preservation of the Qur'an. "The arguments for the divine inspiration of the Qur'an all prove unconvincing when we begin to dig beneath the surface. The literary excellence of the Qur'an proves to be untestable, subjective, and non-sequitur; the prophecies of the Qur'an are not compelling; the science of the Qur'an is actually problematic; the numerical patterns are often distorted data combined with exaggerated interpretations; and the Qur'an has not been preserved in any miraculous sense. This book is a must read for those desiring to better the understand the vast differences between the core tenets of Christianity and Islam. Qureshi simplifies the investigation by focusing on the two questions that guide his quest: 1. Are Islam and Christianity really all that different? 2. Can we know whether Islam or Christianity is true? Moreover, this reader could sense the tension throughout the author's investigation as he wanted to confirm the truth of Islam, but found himself leaning more and more toward the opposite conclusion. This work would also be very instructive for those who desire to investigate the truth of their worldview, but are possibly held back by their strong feelings, fears or other outside factors. Qureshi desires the truth and no matter what the cost, he seeks it. Again, this is instructive for us all. Qureshi wrapped a fair-minded, systematic approach in his own story of how he set out to confirm Islam and became a follower of Christ. Because of this, the book is highly recommended. What are the differences between Islam and Christianity? Can we be confident that Christianity or Islam is true? 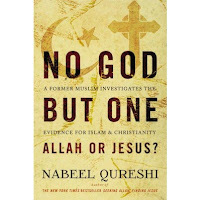 In No God but One: Allah or Jesus, Nabeel Qureshi answers these questions comprehensively and demonstrates just how important it is to seek the truth no matter what the personal cost. 1. Readers should know that I find the claims made by both Christians and non-Christians that Qureshi was not a "true Muslim" before his conversion to Christianity to be absurd and ridiculous. For those who would offer this view, I challenge you to watch this video by David Wood of Acts17 Apologetics. 2. You can find that debate here. I just have one question for the blogger and for Nabeel. Why would all loving God ( which love is from his essence) command his (the most beloved people ) to be holy via ( keeping his commandments , his law or shariah in Arabic ) as we read that in leveticus 19 ? Didn't that " all loving god" know that no one can be holy EXCEPT through the blood of his son? The problem proceeds even furthermore when that " all loving god " kept punishing his the people ( the most beloved people) severely because they couldn't be holy via keeping the law while that " all loving god" had known that no one can be holy except via his son's blood in the first place ?!! Morover, that " all loving god " had kept teaching his the most beloved people that he is not a man nor a son of man, and that he is not like anything that they see , yet he punished them severely since they didn't believe that he is a man dying , sleeping, eatng, and a human like them ?!! I mean if one can reach the Father except through the Son , why would that " all loving god" keep hiding this fact from his beloved people for more than 1500 years? I mean I wouldn't expect that act from an ordinary person, yet he is a sincere person, so imagine if that act coming from " all loving god " ?!! I sense in your question/comments that you have taken an admonition: "Be holy as I am holy"...away from the context of "the all loving god's" provision to enable conformity to that admonition. Briefly, if you start with God's call to Abraham to be the father of "the most beloved people", you see God testing Abraham's faith with obedience in the sacrifice of Isaac. When Abraham moved to obeyed in sacrifice, God provided a means to fulfill that obedience with the ram (Jehovah jirah)...and it was accounted to him as righteousness. The law is a constant and consistent reminded that we are sinners and apart from God's provision we are lost. The provision in the Old Testament was made is a sacrificial system culminating in the yearly, "day of atonement", where God's love was demonstrated over and over again. But it was only accessible through maintaining a relationship within the covenant parameters. And this was a foreshadow of what Jesus; the Lamb of God, would do on the cross, in taking away the sins of the world, once and for all. The provision to conform to the admonition "Be holy as I am holy"...is totally completed in Jesus Christ...because He is both God and man and the perfect Lamb, and by faith in what He did for us...we are made holy and able to be obedient through the abiding presences of the Holy Spirit who has taken up residence in our hearts. Faith, if it is true faith, is coupled with obedience. Obedience not just to the "law"...although that very much sets a norm...but more so, "relationally"...in our relationships with one another and most of all in our relationship with God "the all loving". The apostle John put it this way in 1 John 4:7-10 "Dear friends, let us love one another, for love comes from God. Everyone who loves has been born of God and knows God. 8 Whoever does not love does not know God, because God is love. 9 This is how God showed his love among us: He sent his one and only Son into the world that we might live through him. 10 This is love: not that we loved God, but that he loved us and sent his Son as an atoning sacrifice for our sins." Why Can’t God Just Forgive Us? Part 2. What Is Some Practical Advice For Evangelism? Why Can’t God Just Forgive Us? Part 1. Is Voting for Donald Trump a Good Moral Choice? Video: Why is the Universe so Vast?